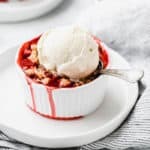 Individual Strawberry Crumble Recipe – Delectable and oh so easy this Strawberry Crumble recipe is the perfect spring dessert. Everyone gets there very own so no fear of someone stealing yours! 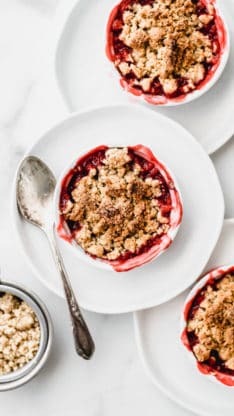 Some of the best desserts that we ever consume are comprised of naturally (with a little enhancement) sweet fruit with some version of a crumble topping. We’re talking peach cobblers, cherry crisps, brown bettys and so much more. They are the epitome of spring and summer baking because they can be made quickly with almost any piece of in season fruit. 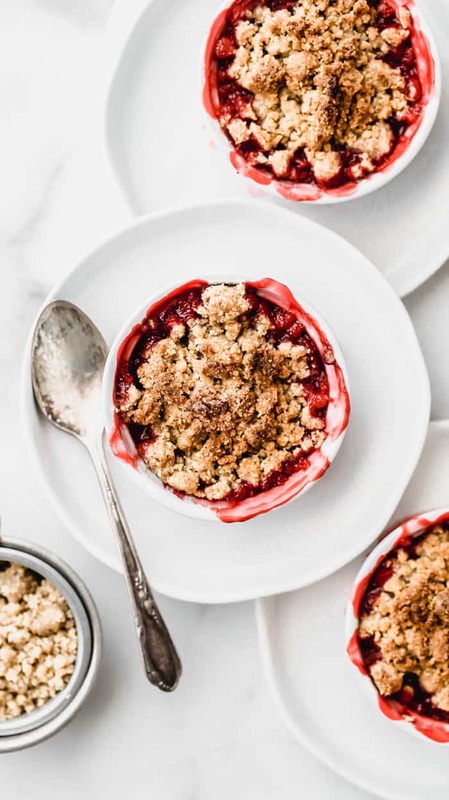 In my house, the perfect fruit crumble is a staple dessert. 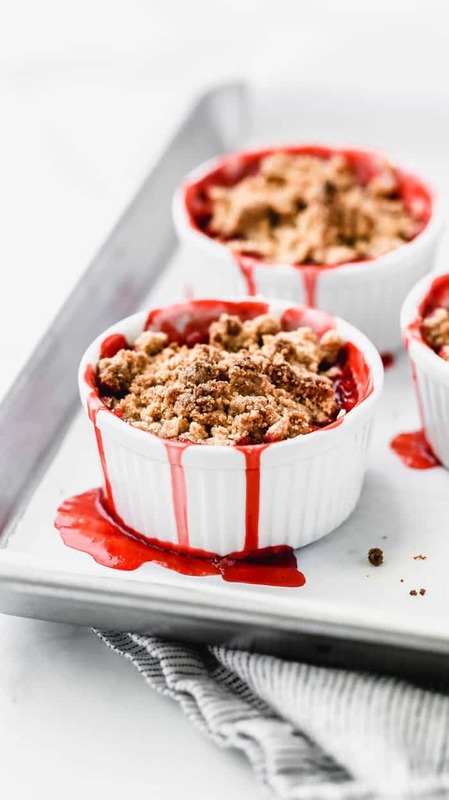 Crumble is a wildly simple fruit recipe topped with a crisp, buttery crumb topping. With each bite the fruit dances on your tongue for a moment and then melts beautifully. The crumbs add a crunchy, salty and slightly sweet element that ties the entire dish together. It couldn’t be more perfect. 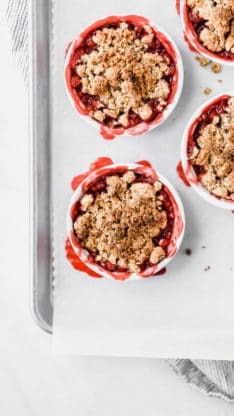 Today, I’m sharing with you my current favorite crumble recipe that features one of the most delicious fruits Summer has to offer: strawberries. They’re that perfect sticky sweet, leave your fingertips pink and scented treat that I crave as soon as the weather warms up. Or sometimes just when I need a reminder that there are sunnier days to come. My individual strawberry crumbles are here to brighten my mood. I’ve been annoyed with the spring weather lately in Chicago. Day after day, I am confronted with consistent 40 degree weather in late April followed by one random day of 70 degree weather, and I’m a little frustrated. On one hand, I want to use fresh spring berries and start on some sorbets and other frozen recipes to ready me for summer. On the other hand, I am constantly still putting on a heavier jacket and drinking hot tea to stay warm. I needed to find a recipe to go well with my “in between” Winter/Spring confusion. This is where my individual strawberry crumbles enter. My husband just loves crumbles so I knew there would be absolutely no leftovers lingering in the kitchen ready to tempt me away from my healthy eating kick. His midnight snacks are my saving grace. Even if I were to indulge a bit, having the individual portions helps to keep me in check. Or at least just a tad more mindful of the three ramekins of crumble I’ve just consumed. Oops. Believe it or not, I threw this recipe together off my instincts and it turned out perfectly. 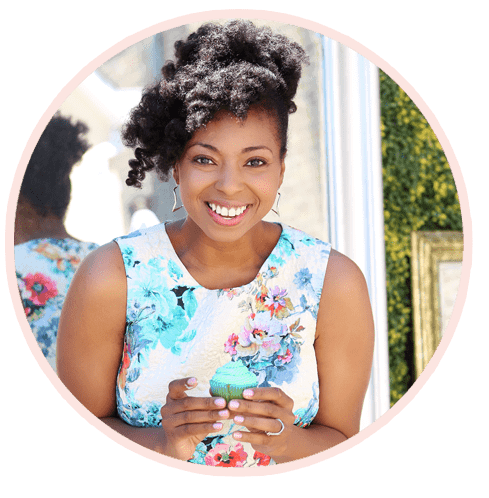 Following, adapting and creating recipes is what my job is all about. 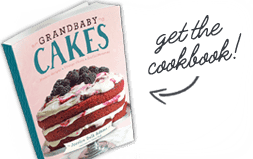 I love taking old recipes and spinning them on their heads or trying out a colleague’s newest brownies and sharing the experience with you. But I have the most fun when I can just step into the kitchen, throw on an apron and run with the wind. The kitchen is where I allow my imagination to go wild and my creativity to be inspired by what I have on hand. The outcomes are usually (maybe not always) incredible. This recipe is the best of both worlds for my “in between” winter/spring weather issues. It was warming and comforting like a winter dessert but it was bright and filled with gorgeous spring strawberries. 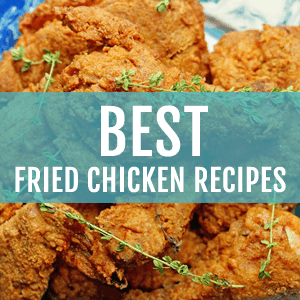 It’s also one of the quickest and easiest recipes that you or I will ever make. First, you toss together your strawberries, orange or lemon juice, granulated sugar, salt, vanilla extract and cornstarch. Together they create a strawberry filling to be reckoned with. In just a short amount of time the mixture thickens and the citrus draws out the bright flavors within the strawberry. While you wait for those plump strawberries to be ready, the crumble is awaiting its preparation. So you grab a bowl, whisk your dry ingredients together and add that gorgeous melted butter until your left with nuggets of buttery goodness. Finally, grab those ramekins and fill them to the brim with that tangy, sugary and slightly acidic filling. Then spoon your crumbs on top and pop them into the oven to ooze and gooze all over until they’re ready. Allow them to cool, or don’t. I have no patience. But most importantly, never forget that wonderfully creamy, cool scoop of vanilla ice cream on top. Wow, I think I’m drooling right now. From beginning to end this recipe is not only bursting with flavor but it’s a simple reminder of all the things I’m looking forward to. These strawberry crumbles has got me so excited for the wonderful weather I am sure (definitely praying) is coming soon! If you like these individual strawberry crumbles, then you might also enjoy some of my other crumble recipes. For the strawberry mixture, toss together strawberries, orange or lemon juice, granulated sugar, salt, vanilla extract and cornstarch in a medium bowl. Set aside. While strawberries sit and thicken, assemble the crumble. Add brown sugar, granulated sugar, cinnamon and flour to a small to medium sized bowl. Slowly add in melted butter and stir in to combine until crumbs develop. Add strawberry mixture to ramekins (I used 2 ounce sized ramekins). Spoon crumbs over the tops of the strawberries. Bake crumbles for 30 minutes. You can serve your crumbles warm or cold but my favorite way is warm with a nice scoop of vanilla ice cream. Enjoy! Ok. So your little girl is the cutest thing everrrrrr lol. Just adorable. 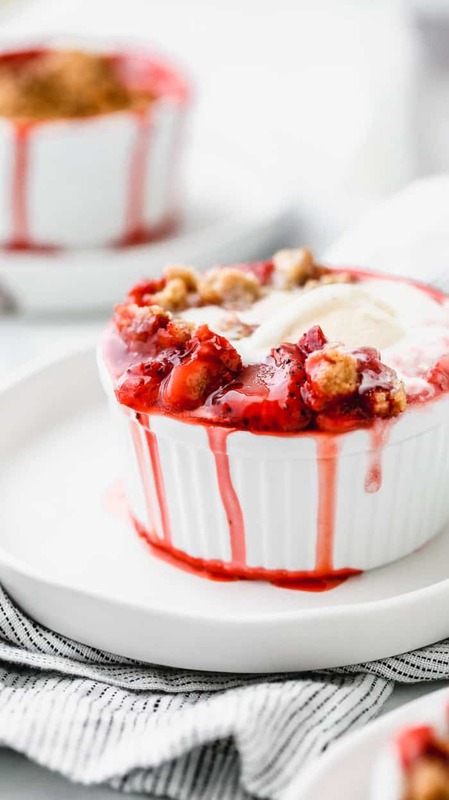 That strawberry crumble is on my list to make STAT! 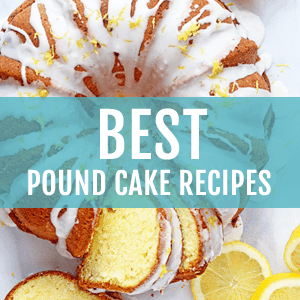 Too many great recipes you have. So little time to make them all!! Thanks for sharing. Have a wonderful Easter. Hey, can you tell me how long to wait till the strawberries thicken completely? I’m afraid I didn’t leave them long enough. Thanks for the recipe! Don’t worry if you don’t feel you thickened them long enough. About 10 minutes should do the trick. How did they turn out for you? 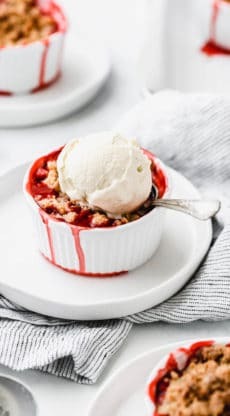 This was the first strawberry crumble recipe I came across while looking for a super quick and very delicious recipe. They are in the oven right now! My 5yr old son and I are drooling away!! Thanks! Thank you so much. Let me know how it turns out. Beautiful crumbles! Right on time for strawberry season. I will make this once I get my hands on some sweet and juicy strawberries. By the way, the weather has been pretty weird this year. There has been so little rain in So California. It is very dry. We are not anywhere near fire season, but we have 3 wild fires today. Hopefully, we will get some late rain or something. Thanks so much Carol! Geez, is anyone having nice weather. And P.S., I ate my husband’s extra crumble that I saved him. I will have to make more this weekend! I like the contrast of the blue plating. And don’t you just love whipping up something that makes sense and everyone around you loves! I love crumbles, too, but don’t make them as much b/c I’d literally eat it all before I could share. Thanks so much Bren! And yes, I adore crumbles a little bit more than I should. Perfect dessert if you ask me! We have a bit of that weather confusion in Los Angeles too. Gray and cool 3 or 4 days in a row, followed by mid-80’s during the weekend. Hey, if the berries are there, use them up however you can! Exactly! The weather confusion must be everywhere I am afraid. 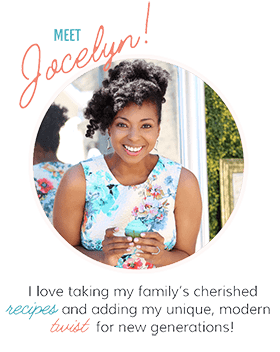 Perfect recipe for this crazy weather, Jocelyn! Can’t wait to give it a try! Thanks so much Valerie. Gosh you live in Michigan so you totally know what I am talking about.